This is the Future of Barbering! Wouldn't You Love This Kind of Exposure for Your Barbershop? Who wouldn't, right? Hundreds, perhaps thousands of people see your work each day. And all they have to do is walk by. Just imagine how many more prospects, customers and sales you'd have operating in a location like this. How Can You Keep Most of Your Sales Revenue? Barbers are in big demand today. It is easy to generate lots of revenue cutting hair in a busy, high-traffic location. It is NOT easy to KEEP most of your revenues in a busy location. Did you know that many barbers in high-traffic locations just barely earn a living? Some actually lose money every month. How can that be? Like this. Many of those barbers pay out practically all the money they take in. "On what?," you might be thinking. Converting empty space into a barber shop now averages over $160,000. It costs a great deal more, if you want a fancy barber shop. In addition, they also pay the highest rent per square foot. Busy, popular retail locations are almost always the most expensive places to put a business in your market. Those are FACTS, not opinions. Here is another fact. After all the bills are paid to be in a high-traffic location you can find yourself earning LESS MONEY than you might earn by renting the third chair in a slow barber shop. This is a tragic and more common story than you might think. Don't Just Churn Dollars. EARN Them! The key to REALLY increasing your pay as a barber is to figure out a way to do two things at the same time; 1) Cut hair in a high-traffic location and 2) KEEP most of the money you take in. The Barber Stop organization developed and patented a way to do EXACTLY those two things. 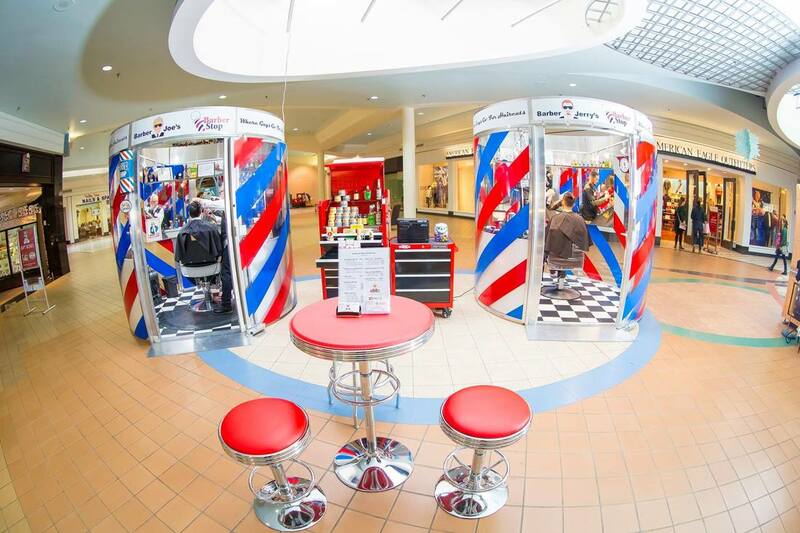 The Barber Stop single-chair shop makes it possible for you to cut hair in a high-traffic location, generate plenty of revenue and keep most of what you take in. Best of all, we are committed to sharing this new business model with the entire barbering industry. Some well-known industry leaders call Barber Stop the most significant innovation in barbering since the electric clipper. Here is what Ivan Zoot (Clipper Guy); holder of 3 world records for hair-cutting has to say about Barber Stop. He made this YouTube video at a barber show in 2008. He is touring one of the original Barber Stops. New Barber Stop shops have a little more hip furnishings but, the video will give you an idea of what it is like inside. Disregard the telephone numbers you see in the video. They are old and out of service. You can reach us directly today by calling or texting Joe Sexton at (608) 397-0155. The process goes something like this. We start by finding and talking to the best barbers. It takes the best because single-chair barbers have to do it ALL. Know all the cuts. Cut all kinds of hair. Do every cut flawlessly. You cannot hide behind the skills of other barbers in a single-chair shop. It's all you. If you like that idea, we will show you how to operate a Barber Stop single-chair shop. There are lots of options. While we build your Barber Stop shop, we teach you how to find a great location. Then, we teach you how to approach these potential hosts with our new business model idea. Barber Stop is MUCH more than just a new place to cut hair. It is an entirely new way to be a barber. It is a new and vastly more efficient business model. The Barber Stop business model took twelve years and over two-hundred thousand dollars to perfect and document. Here is the best part. If you run into a situation you not sure how to handle, you are encouraged to call us. Barber Stop owners have direct access to the highest levels of the Barber Stop organization. Barber Stop owners are NEVER alone. Your investment in a Barber Stop makes you a member of the Barber Stop Network of America. Everette Blaisdell and I started this organization to help barbers become more business oriented. The barbering industry has too many artists and too few business people. The national chain store hair cutters have exactly the opposite problem. They have too many business people and too few artists. Here's the difference, national chain store hair cutters have 93% of the market. Barbers have only 7%. In other words, below average hair-cutters backed by people with better business skills have all but eliminated barbers from the market place. That needs to change. Everette and I are already changing that in our markets. We'll help you change it in yours if you give us a chance! Membership in the Network gives you a direct connection to the founders of Barber Stop, their circle of trusted advisors and other Barber Stop owners/operators, everywhere. This puts you in a position to associate with and learn from some of the best business, business development people and barbers in the world. It also guarantees you a voice in the ongoing refinement of the Barber Stop shop and the Barber Stop business model.